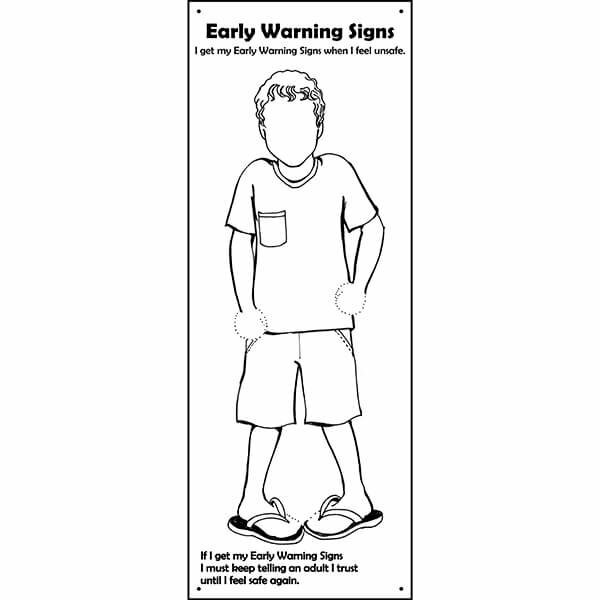 Early Warning Signs banners are great for teaching children about Early Warning Signs. They are perfect for childcare settings and primary schools. We recommend using this banner in conjunction with our Early Warning Signs posters. This way, children can use the posters as a reference to make sure they draw all of our Early Warning Signs. Step 1: Lay the banner on the floor and, using whiteboard markers, brainstorm different possible Early Warning Signs with your children. This is a great way to reinforce this important concept of child protection education. It will help the children see where Early Warning Signs occur in and on their bodies. Step 2: Ask the children to use the poster as a reference, and draw any remaining Early Warning Signs onto the banner. Step 3: Use the X stand supplied, and proudly display the children’s work in the classroom. Bonus: You can easily clean your banner with a multi-purpose household cleaner so you can use the banner time and time again. We send the banner and X stand to you in two different boxes. Each banner is 160 cm high and 60 cm wide, and they are available in four versions. Signup for the latest product and news!